Credit where it’s due: I didn’t develop the information I’m sharing — but it’s too good to merely retweet or “like.” My enthusiasm stems from one of the world's most famous, influential, and capable people getting fully behind sustainable wastewater treatment and direct potable reuse, bringing widespread attention to typically underappreciated water issues. That person is Bill Gates, most notably the multi-billionaire co-founder of Microsoft, but also (more to the point for this story) co-chair of the Bill & Melinda Gates Foundation, which works to combat extreme poverty. Much of the Foundation’s recent focus has been on clean water availability and sanitation, but has only tangentially related to what we report at Water Online … until now. Gates was on-site to sample the water straight from the machine, as shown in the video and related in Gates’ own blog, The Gates Notes. According to Peter Janicki, inventor of the OmniProcessor, the end product compares favorably to the store-bought bottled water he tested it against. 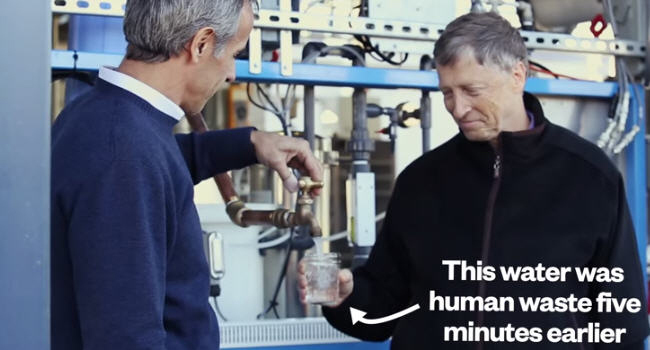 “Our water meets or exceeds the standards of every one of those,” quotes Wired. Furthermore, the sludge creates enough energy to power the system, and even to sell electricity back to the grid. The operator can also get paid for accepting the raw sludge, then paid again for selling the processed sludge (aka biosolids) as a fertilizer. While the OmniProcessor is hoped to resolve issues in the world’s most water-challenged and poor regions — in India and Africa, for example — it sounds a lot like the “Utility of the Future” endorsed by the National Association of Clean Water Agencies (NACWA), the Water Environment Research Foundation (WERF), and the Water Environment Federation (WEF) here in the U.S.
Bill Gates’ involvement has inspired scads of mainstream media coverage and thousands of “shares” on social media from those both in and outside the water/wastewater industry. I'm swept up in the sharing as well — the enthusiasm is well-deserved.